GrabOne’s All Stars event brings you all the best brands and only the best deals. 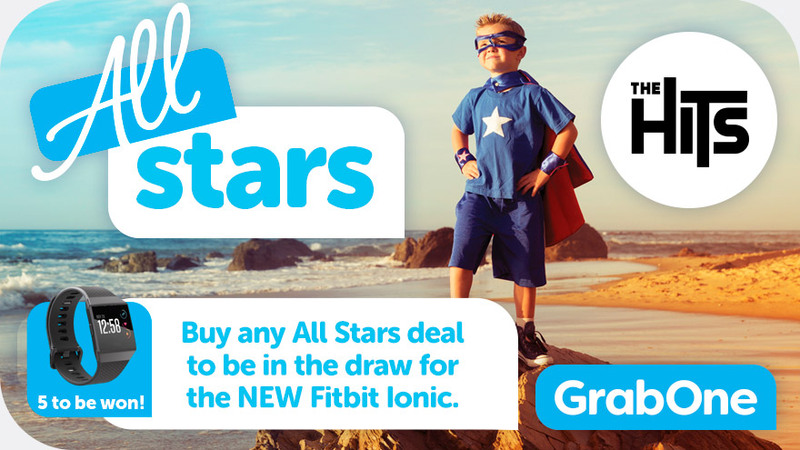 And as if that wasn’t reason enough to grab life, if you buy any All Stars deal you’ll be in the draw to win one of five of the yet-to-be-released Fitbit Ionics! Simply buy any All Stars deal between midnight and 4pm on Monday September 25th 2017 – Friday 29th September 2017, and tune into The Hits between 5pm-6pm for the announcement of the winner! Enter by purchasing any ‘All Star’ deal, as featured on Experience All Stars, Product All Stars or Escapes All Stars. There are five Fitbit Ionic smartwatches to be won in total, with one available to be won each day Monday September 25th 2017 – Friday September 29th 2017. Deals purchased between 12.00am-4.00pm on Monday September 25th will go into the 5.00pm draw on that day. Deals purchased between 4.00pm on Monday September 25th – 4.00pm on Tuesday September 26th will go into the 5pm draw on that date and so on, with the final purchase considered for the 5.00pm draw on Friday September 29th to be made by 4.00pm on that day. The draw will be made at 4.00pm on each day and the winner will be notified by phone between 5.00pm-6.00pm on the same day.The prize will be shipped to the address provided by the winner within 6 weeks of the draw being made. GrabOne cannot be held responsible for any loss or damage that may occur in shipping. No parts of the prize package may be substituted, transferred or on-sold. Charging cableGrabOne Ltd may in its sole discretion disqualify any entrant who it believes has attempted to or has subverted the registration and entry process. Employees of GrabOne, NZME. or any of the businesses supplying a prize, are not eligible to enter.